Zundert Trappist 8 (ABV 8%) is a Tripel brewed by the Trappist monks at Brouwerij De Kievit (The Lapwing Brewery) within the walls of Abbey Maria Toevlucht in the town of Zundert in the Netherlands. The abbey describes this beer, made with water, barley malt, candi sugar, hops, yeast, and herbs, as "slightly unruly", and recommends taking time to savor and understand it. Clear chestnut-colored and bottle-conditioned, with an aroma of caramel, herbs and spices, its initial impression is floral and slightly sweet; its character develops from light caramel to a lovely, dry, mellow hoppy bitterness as the flavor opens. 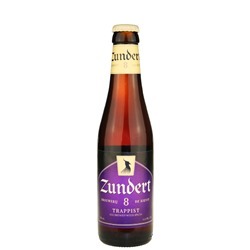 Zundert 8 evolves with each taste and defines a new chapter in the book of excellent Trappist ales. Ratebeer.com rating: 89 (out of 100); 11.2 oz (capped) bottle. Food Pairings: Peking duck with hoisin sauce, goat cheeses, grilled tuna, spicy Southeast Asian cuisine, Boerenkoolstamppot (hearty mashed kale and potatoes with smoked sausage, a traditional Dutch meal), mussels. Serving Recommendation: Zundert Trappist 8 is traditionally enjoyed in a Zundert chalice (or similar glass) at 45-50 °F. The Abbey of Koningshoeven established Abdij Maria Toevlucht (Abbey of Our Lady of Refuge) in 1900 as a place of refuge for French monks in the quiet countryside outside the village of Zundert, near the Belgian border. By 1938 the priory of Zundert was elevated to the status of an abbey. For many years the monks maintained a dairy farm to support their life of prayer and charity, but by 2007, with a dwindling community (vocations had peaked in 1950 with 80 monks), they began looking for an activity that would provide a good ratio between the required effort and financial yield, as well as an appropriate size. In 2009, careful consideration led to the decision to start a small brewery. A small brewery, because as it's been said: 'monks brew to live and do not live to brew'. The brewery, built in one of the abbey's historical farm buildings, began selling beer in 2013. The lapwing ("kievit") weathervane on the roof inspired the name of the brewery, and remains in place. Brouwerij De Kievit - "The Lapwing Brewery" - also uses the beautiful crested northern lapwing in its logo. I found it had an unusual "strong" character to it for an 8% beer. It wasn't necessarily a boozy or alcohol presence... just something about the flavor gave it a "strong" taste. Not a bad beer. Not quite up to the standard I've come to expect from other Trappist beers, but still nice.